Click on the 2019 Summer Brochure and flip through to page 21. 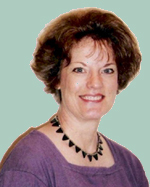 Read about using beats to craft compelling scenes at Fiction University. Excerpts from my 2012 lecture. Visit the Odyssey website or click on the files below to download. 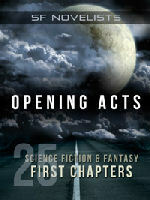 Opening Acts offers up the first chapters of 25 science fiction and fantasy novels that will surely whet your appetite for more! It's free. It's available to read online or download in multiple formats. And it's a great way to discover new authors and meet up with some old favorites. Visit Smashwords or SF Novelists to learn more or start reading. and love can change your destiny. Now available from DAW Books. 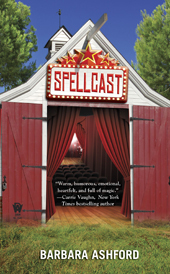 "Spellcast and Spellcrossed are beautiful and wonderful stories about the love of the stage, finding where you belong, and helping others. The stories show how love is difficult when both parties are still letting their past haunt them. Together they are a tale of redemption and hard choices, atonement for mistakes and standing up for what you believe in, even if you are standing alone. Brava!" Read the whole review at The Quillery. "If you like gentle fantasy, cozy mysteries, and screwball romance, and a backstage look at show business, these stories will fly you into your happy space." Read the whole review at Kings River Life Magazine. you have to understand your past. “A surprisingly poignant novel that vividly ensnares the reader in the alluring ambience of make-believe. Ms. Ashford...takes a traditional theme and breathes life and dimensionality into it. A truly enjoyable fantasy woven by an author with a deft touch at creating a realistic and emotional love story.” Read the whole review at Night Owl Reviews. “One of those rare gems of a fantasy novel, Spellcast is an original, something completely unique in the pantheon of novels I have read over a lifetime. It is a love story, a fantasy, a mystery, and a theatre book all rolled up into one…” Read the whole review at New Myths. Night Owl Reviews "Top Pick"
"[The] deft mix of magic and...interpersonal problems creates a mesmerizing read. I can only hope that there will be more tales set in this enchanted corner of the world!” Read the whole review. 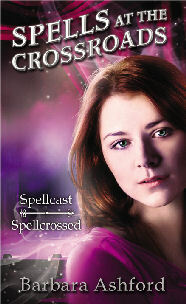 “Spellcrossed is whimsical, lyrical and one hell of an emotional journey. You feel like the characters are real people. You root for them, you cry for them & your heart feels heavy when you are finished reading because damn it you want more.” Read the spoiler-free review at Wicked Little Pixie. 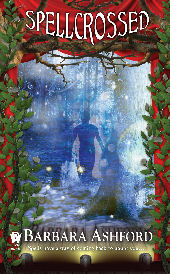 “Spellcast had me spellbound, and Spellcrossed was no different. [It] moved me to tears more than a few times, and was equally heartwarming and heartbreaking. I can’t recommend this series highly enough!” Read the spoiler-free review at My Bookish Ways. “Fantastic sequel in a magical, emotional, heartwarming series. [It’s] an emotional roller coaster full of surprises, both good and bad. If you're a fan of romance, vivid writing, well-crafted and relatable characters, then I suggest you give Ashford's series a try, starting with her debut Spellcast.” Read the spoiler-free review at Addicted to Heroines.